Check out our many clients from a wide variety of fields, specializations and geographical regions! Marlin Steel serves the biotechnology sector with superior quality custom-engineered stainless steel wire forms and stainless steel wire products. Not only that, but our automated processes help ensure fast delivery and consistent results! Clients include: Abbott, Allergan, Amgen, AstraZeneca, Baxter, Boston Scientific, Cleveland Clinic, Edwards Lifesciences, GE, Genentech, Karmanos, Medefil, Medtronic, Merck, Millipore, Quest Diagnostics, Roche, RTI Biologics, Sanofi Pasteur, Schering-Plough, Smith Medical, Smith&Nephew, Thermo Fisher, University of Kansas Hospital, VA Medical Center, Wyeth, and Zimmer. Marlin Steel supplies our industrial clients with the top-quality, precision manufactured metal forms that they need to meet their goals. Clients include: Alcoa, Arcelor Mittal Steel, Avon, Baldor Electric, Battelle, Bechtel, Bosch, Bose, Caterpillar, Cintas, Citation, Clorox, Colgate-Palmolive, ConocoPhillips, Drecktor Shipyards, Danaher, Dolby Digital, Dow, Dresser, Eaton, Electrolux, Energizer, Exelon Nuclear, Georgia-Pacific, Gore, Grainger, Hamilton Sundstrand, Honeywell, Ingersoll Rand, Intel, International Paper, iRobot, Jabil Circuit, Johnson & Johnson, Kamantics Corp., Kimberly-Clark, Knoll, L3, Lexmark, Lear Siegler, Lincoln Electric, Magna, Maytag, McMaster-Carr, Merchandise Mart, Modern Office Systems, Modine, Mohawk, Nobel, Nucor, OPW, Parker, Proctor and Gamble (P&G) ReMax, Ricoh, Rockwell Automation, Rohm & Haas, RPM Rubbermaid, Rust-oleum, Saint-Gobain, Schering-Plough, Sherwin-Williams Sigma, Snap on Tools, Timken, Trane, Unilever, United Technologies, Westinghouse, xilinx, and Zimmer. Helping to keep the U.S. strong and promoting peace around the globe, Marlin Steel serves the U.S. Military with top quality, custom manufactured stainless steel sheet metal products, wire forms and stainless steel wire products. Clients include: AAI, ATeam/Kansas Army National Guard, Beretta, Colt Defense, DRS Technologies, General Dynamics, L3 Communications, Letterkenny Army Depot, Northrop Grumman, Ogden, Tenth Combat Support Hospital, U.S. Air Force, U.S. Dept. of Veterans Affairs, Anniston Army Depot, Grand Forks AFB, Hill AFB, Holloman AFB, IRS, Keesler Air Force Base, National Institutes of Health, Robins AFB, Raytheon, Robins Air Force Base, Rock Island Arsenal, Tinker AFB, Tobyhanna Army Depot, United State Navy (Fleet Readiness Center), United States Army Medical Research Institute of Infectious Diseases (USAMRIID), United States Dept of Veterans Affairs, US Naval Academy, Warner Robins Air Force Base, and Wright Patterson AFB. Our precision engineered wire and sheet metal forms are made to the exacting specifications required by R&D facilities. Clients include: Booz Allen and the SLAC National Accelerator Laboratory. Serving the Aero Space Industry with Superior Quality, Custom Engineered Stainless Steel Wire Forms and Stainless Steel Wire Products, FAST Delivery! Clients include: AAI, Amphenol, BAE Systems, Bell Helicopter, Boeing, California Jet Propulsion Lab, Cessna, Delta, GKN Aerospace, Gulfstream, Lockheed Martin, Marathon, NASA, Pratt & Whitney, Sikorsky, and StenniSphere Astro Camp. Learn more about our aerospace designs and clients here! For years, we've served the automotive industry with top-notch, custom-made stainless steel wire forms and other wire products. Clients include: Amphenol, Borg Warner, General Motors (GM), Goodrich, Harley-Davidson, Kyocera and Kyocera Japan, Honda, Mack, Magna, Mazda, Modine, Parker, Rolls-Royce, Ryder, Safety-Klean, Toyo Automotive, Toyota, and Volvo. Marlin Steel provides retail clients with custom metal forms such as wire and sheet metal racks quickly and efficiently. We manufacture food-grade stainless steel components and parts cleaning baskets for a number of food industry clients. Our food clients include: Bacardi, Budweiser, ConAgra Foods, Darden Restaurants, Edy's, Fleming's, FritoLay, General Mills, Gordon Food Service (GFS), Hormel, Kodiak Cakes, Kozy Shack, Longhorn, Nestlé, Olive Garden, Palm Restaurant, Pepsi Co, Russell Stover, Tyson Foods, Waffle House, Whole Foods, and Wrigley Manufacturing Company LLC. We also make custom metal forms for major print publishers! Clients include: The Washington Times. 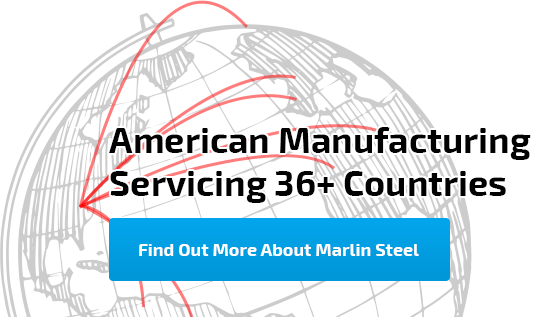 Marlin Steel is proud to help serve the needs of our nation with our custom-made sheet metal and wire products. Clients include: CIA - Central Intelligence Agency, Federal Reserve Bank of New York, Internal Revenue Service (IRS), Kansas Dept. of Health & Environment, National Institutes of Health, United States Mint, and the Port Authority of NY & NJ. Marlin Steel products have been used by a number of educational facilities, including: Harvard Medical School, University of Michigan, Medical College of Wisconsin, Nazareth Area School District, Purdue University, Stanford University, Texas A&M, University of Virginia, and the University of Wisconsin. When architects need specially-made metal forms, they turn to Marlin Steel. Clients include: Skidmore, and Owings & Merrill LLP (SOM). Marlin serves travel-oriented businesses with superior custom engineered wire forms and other stainless steel products. Clients include: Hilton, Marriot, Sheraton, The Mayflower Renaissance Washington, DC Hotel, and Waldorf-Astoria. Marlin Steel supports the arts whenever they need custom-crafted metal forms and pieces! Clients include: the Museum of Modern Art in NYC. Even Hollywood needs custom wire forms and sheet metal punches from time to time! Clients and projects that have incorporated our metal forms include: Brotherhood, Disney, Ghosts of Girlfriends Past, Nickelodeon, Paramount Pictures, Pink Panther II, The Wire, The Surrogates, and the Rock and Roll Hall of Fame. We serve Japanese companies with high quality custom-engineered stainless steel wire forms and sheet metal products, all with fast delivery. Japanese clients include companies such as: Akebono, Hitachi, Honda, Mitsubishi, Takata, Tokico, and Toyota. Marlin Steel provides custom metal forming services for companies located in dozens of countries outside of the United States. 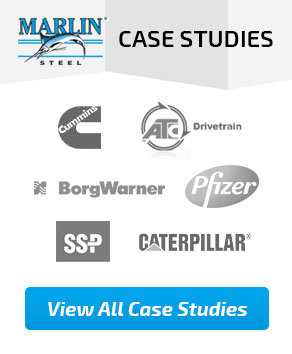 On every manufacturing job, Marlin Steel's engineers bring client quality engineering, quick.